Australia’s corporate bond market is misunderstood and investors should stop overlooking it, Nick Bishop writes. The fissures of the 2008 global financial crisis (GFC) run so deep that almost a decade later developed markets are far from returning to normal. Government bonds, which pension funds and insurers used to count on as a source of risk-free return to meet their liabilities, are still being hoovered up by central banks. Yields remain historically low, leaving investors worldwide scratching their heads in their search for reliable income. Australia’s corporate bond market is an overlooked option, despite being among the strongest and most stable in the world. 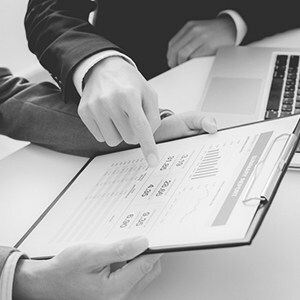 Local companies manage their balance sheets very conservatively, offering a risk-adjusted return that’s hard to match. 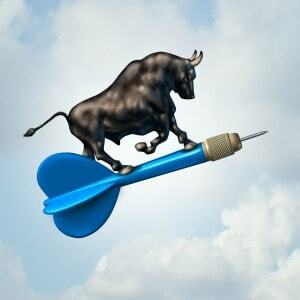 In this article we outline the key reasons why investors might want to consider it. Investors tend to think of Australia’s corporate bond market as small and illiquid with a heavy skew towards banks. Clearly the US has by far the world’s largest credit market, at US$8.6 trillion ($10.7 trillion); alone it accounts for 55 per cent of the Barclays Global Aggregate Index. By contrast, Australia’s non-government bond index stands at around $250 billion and represents just three per cent of the index. But such benchmarks predominantly comprise fixed-rate bonds of a certain size. Add in floating-rate notes issued both domestically and offshore, along with inflation-linked bonds and mortgage-backed securities, we estimate the market at nearly four times the size, at $900 billion. While bonds issued by financial companies make up a third of the market, they account for 29 per cent in the US. Little different, in other words. 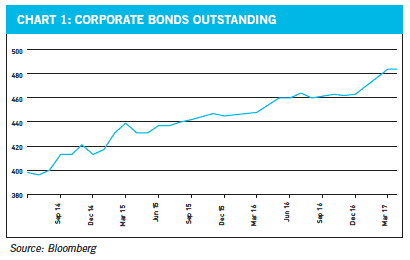 Moreover, there were 484 Australian corporate bonds outstanding by mid-2017, a figure that has grown 20 per cent over the past three years (see Chart 1). This shows there is enough choice for investors to diversify in Australian credit. We anticipate further growth too, with companies primed to capitalise on cheap funding from low rates to issue debt as banks pull back from lending, and global companies that have entered Australia increasingly turn to the local bond market to raise funds. 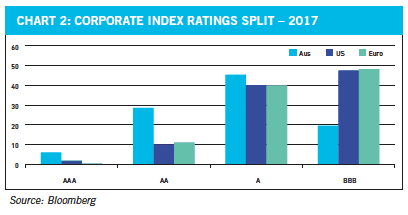 The average credit rating for Australia’s one-year corporate bond index is A+, a full two notches above the US, Europe and Asia. 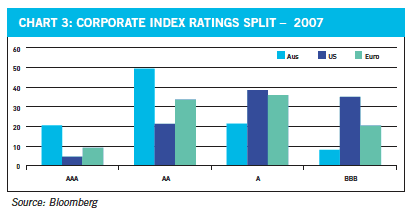 Nearly 60 per cent of Australia’s credit index is rated A, compared with less than 40 per cent for the US and Europe. It reflects the stronger position that Australian companies are in to pay back what they borrow. The US and Europe have seen bond quality deteriorate sharply. A decade ago paper issued with a BBB rating accounted for little over 20 per cent of Europe’s investment grade credit market and around 35 per cent in the US. Today, it is almost 50 per cent for both. By contrast, ratings in Australia’s market have remained constant (Charts 2 and 3). The reason is they take a far more conservative approach to managing their balance sheets. They have not been increasing leverage to fund share buy-back programmes or raise dividends to the extent of their US peers. By taking on more debt, US firms are increasingly vulnerable to rising rates, which would cut their profitability and could threaten their ability to pay fixed coupons, which could lead to default. If we look for examples, BHP Billiton has lowered its payout ratio to 50 per cent – fortifying its cash position – while both Fortescue Metals and Rio Tinto have spent billions buying back their own bonds, in so doing reducing their debt levels. Despite minimal debt in its capital structure, Vicinity Centres continues to lower its leverage targets. 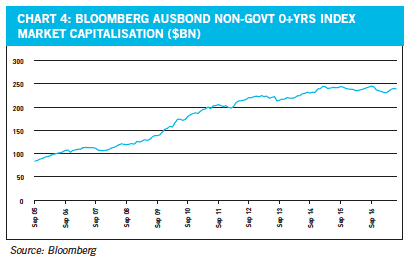 It should give Australian bond investors peace of mind to know their money is invested in a high-quality market. The average yield to maturity for the Bloomberg Ausbond Credit 1yr+ Index stands at 3.18 per cent, which is way ahead of Europe’s 0.91 per cent and marginally below the 3.36 per cent for both the US and Asia. But when you look at average duration of the bonds – how long it takes for capital to be repaid – Australia’s market is by far the lowest, less than half that of the US (see Table 1). The longer the duration, the greater the potential impact of rising yields. It means Australia’s market is far less sensitive to rising interest rates. In today’s environment, investors would be less exposed to risk of capital loss in the event that the US Federal Reserve pursued a tapering of asset purchases or raised rates more aggressively than expected. An investor faced with bonds of similar yields would always choose the one with a shorter duration if they were worried about rising interest rates. You get your money back quicker with less risk of loss. While we cannot dispute that the US market is more liquid – meaning investors can trade in and out more easily – if market conditions become adverse, US bonds have half the room for yield spreads to widen before investors start to lose money. 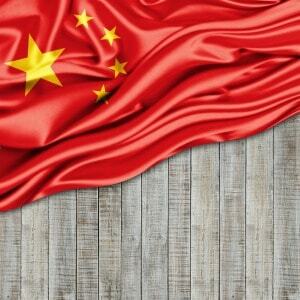 It underlines the relative value of Australia’s credit market versus others around the globe. We expect low government bond yields in the developed world to persist for some time, enabling Australia to retain its advantage in terms of relative value. Certainly, the Reserve Bank of Australia has no room to manoeuvre on rates. It can’t cut them for fear of fuelling rampant property buying that has left consumers heavily indebted already. At the same time lack of inflation in the economy provides little reason to raise them. Wage inflation is at its lowest level in decades, while global reflation expectations have lost steam, with China’s decelerating growth applying a brake to the commodities recovery and US President Donald Trump hamstrung in his efforts to push spending plans through Congress. A weak inflationary backdrop, combined with vulnerability in Europe’s banking sector, should preclude aggressive moves by both the Fed and the European Central Bank to raise rates or withdraw emergency bond-buying. It means companies will continue to take advantage of low rates to issue bonds, supporting the market’s continued growth and diversity (see Chart 4). 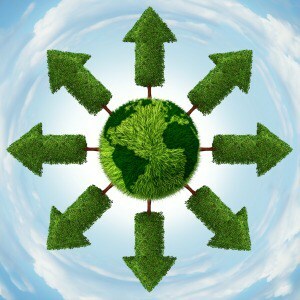 In turn that should underpin demand from investors seeking a premium. Outside of a sharp economic slowdown in China, which we do not anticipate, it’s hard to see conditions changing anytime soon. Nick Bishop is head of Australian fixed income at Aberdeen Standard Investments.